Everyone can personally relate to this topic, whether you are the one forgiving or the one being forgiven. 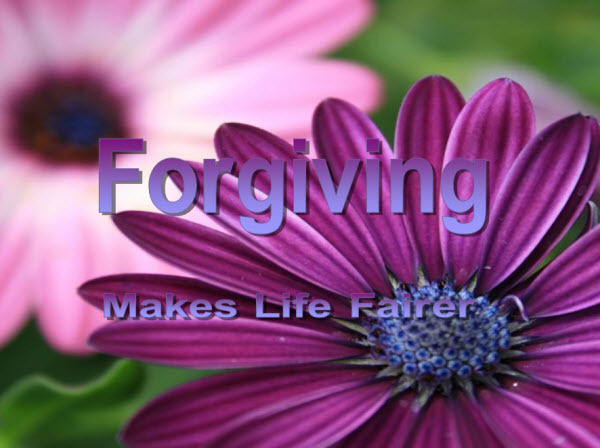 Forgiving may be one of the hardest things that we must do throughout our lives. It is very easy to hold grudges against people, but it is very unhealthy. When you forgive you allow broken relationships to be mended. It is unforgiveness that destroys so many relationships, causing the relationship to be ruined forever. However, forgiving does not mean that you forget what has been done towards you, it just means that you haven't allowed that situation to make you bitter towards the person that did you wrong. Forgiveness is a gradual process, you need time to completely forgive someone who has done you wrong. There is a saying, "I forgive you, but I won't forget." This is true to a certain extent, but a lot of times when you truly forgive someone for what they may have did to you in the past, as time transpires you tend to forget what they have done. The degree of forgetfulness does vary from situation to situation. Some things are easier to forgive than others. When you don't allow yourself to forgive others, you carry around that negative weight, which you may not even know existed until you come in contact with that person that you haven't forgiven. However, just because you forgive someone, that does not mean that you should allow them to take advantage of you. Some things in life are easier to just let go. It is better to be at peace about certain situations than walking around mad about what someone did to you. While you are mad, they are going on about their life not affected at all. You should always forgive others, because if the tables were turned you would want to be forgiven. Sometimes, you don't even have to say a word at all for someone to know that you have forgiven them. Forgiveness takes place in the heart and can be seen by your actions. So examine your heart and make sure that you have plenty of forgiveness in there. The world isn't perfect and forgiveness is a requirement of a healthy life. Your images and words are so stimulating and true. I like the passages, "that some things are easier to let go. I love you and keep up the Good work!! !